I've been thinking about getting back to blogging one of these days! 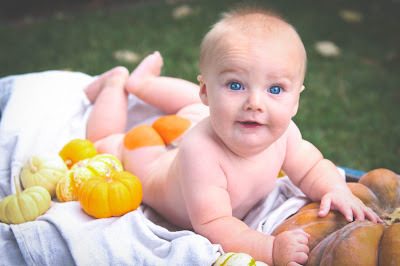 Some day I'll be back, but for now it's just to wish you all a Happy Halloween from the newest pumpkin in our patch! We love those buns, Chase James! This is my partial excuse for neglecting this poor blog (the two crazy little ones keep me pretty busy too). I really do hope to give the blog a bit more attention in the upcoming months, at least by posting some of my recent creations! I've got my fun little etsy shop up and running! I've been busy creating custom artwork, pillows and children's clothing! 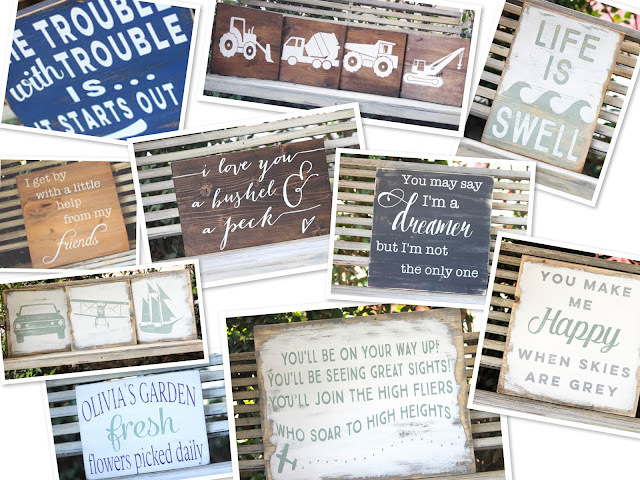 Above is a little peek at my wooden signs. I'll post some of my pillows and kids clothing soon (or just go check out my site)! I have thoroughly enjoyed the stories that total strangers share with me. I love creating personalized gifts, that I hope hold special meaning. I've done so much fun custom work (nursery decor, weddings decor, baby shower gifts, special mother's day gifts, even worried grooms-to-be looking for the perfect gift). 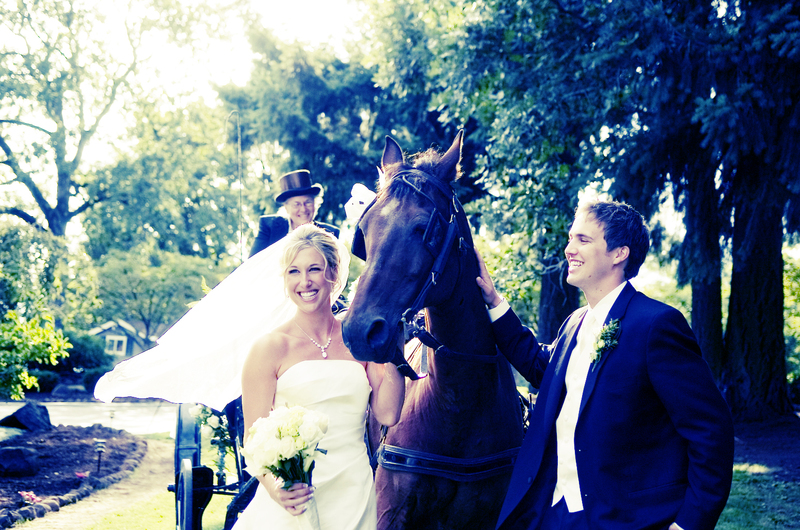 It's such fun to create for these special occasions! So there you have it. That's just a little bit of what's keeping me busy these days and I'm hoping it will continue to keep me busier and busier because I thoroughly enjoy it! Check out my shop when you get a moment and let me know if you've got requests. I do love those custom orders! OH and... since you're still hanging in there and reading this blog that so seldom gets a post, you deserve SOMETHING special! And one more quick note...this may be the best part yet...I'm at 97 sales on the etsy site! If you're sale #100 you just may get somethin' special! Today marks 9 years with my favorite guy. I'm so grateful for all that we've done so far and I can't wait for what's to come. I just went a little crazy with the reminiscing, so forgive me for all the photos! I just loved this day so much. And, wow, we looked really young. Happy anniversay, my love! Thanks for making every day an adventure and every night a slumber party. And most of all, thanks for the countless happy moments with these two. 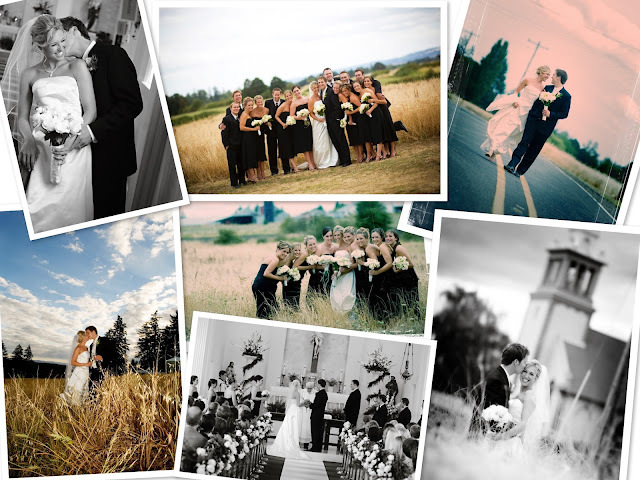 Beautiful wedding photos by Holland Studios. 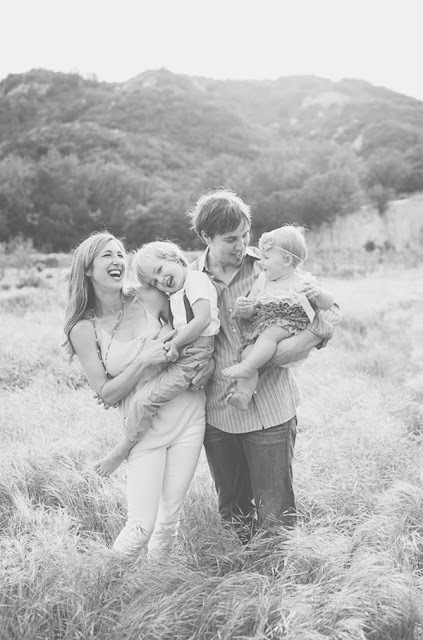 Sweet family photo by Jack and Lola Photography. 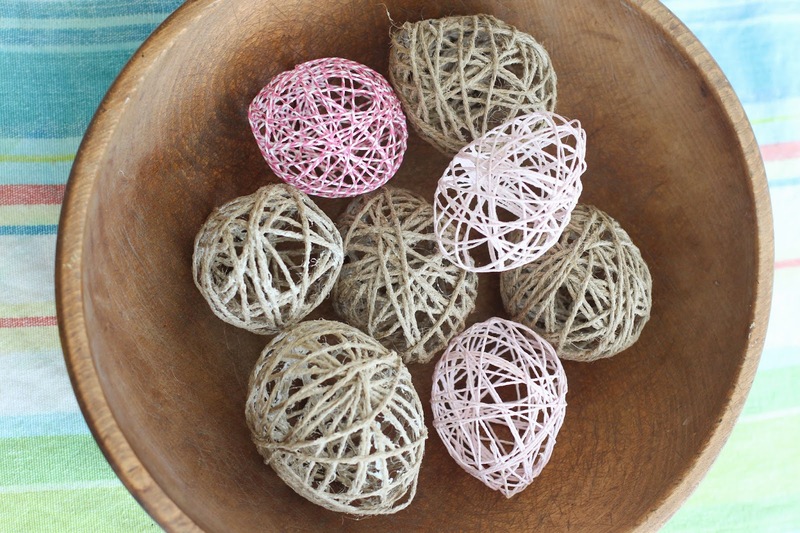 Here's another simple, toddler friendly project, that makes some really pretty Easter decor! Chances are you've got all you need for this project lying around the house. Scrounge up some balloons and twine/string/yarn, then hit the kitchen for some flour and water and you're ready to start! Blow up balloons to the size and shape that you'd like your eggs. If you're going for "real" egg size you may want to try water balloons. Make a paste with the flour and water. I used 1/4 cup flour and slightly less than 3/4 cup water. You want the paste fairly runny so you don't up with chunky eggs. Whisk well until no lumps remain. I found that it took about 18yds of twine per egg. Our eggs were pretty large, though, so you may need to experiment to get the perfect amount of twine. We used regular jute twine (that I buy at home depot) and some cute baker's twine. I actually like the look of the regular twine better and it's a whole lot cheaper. Plain old yarn would work great too! 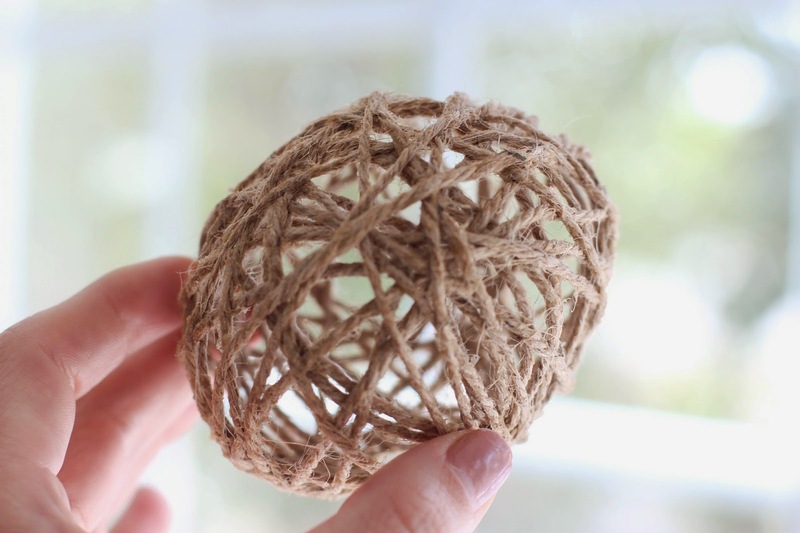 Make sure to saturate the twine with your paste, then wring it out so it's not lumpy. 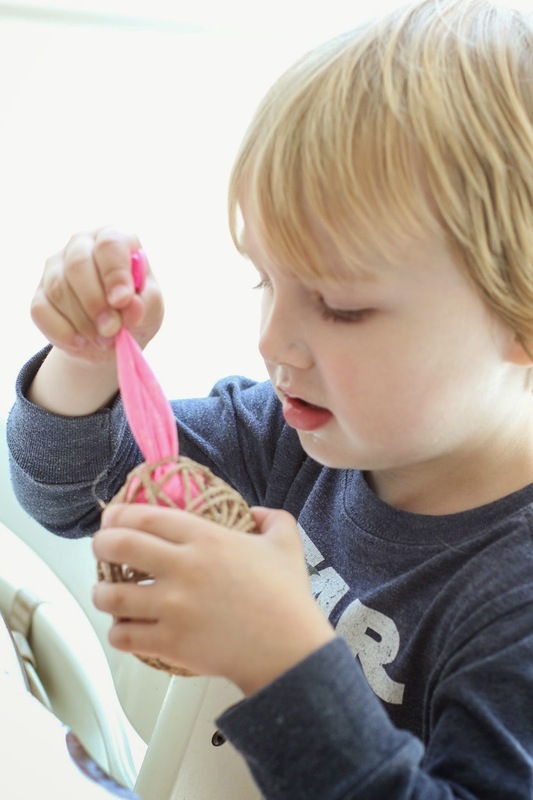 Wrap the twine around the balloon however you'd like! It takes about 24 hours for these to fully dry. You might be able to get away with less time if you dry them outdoors? 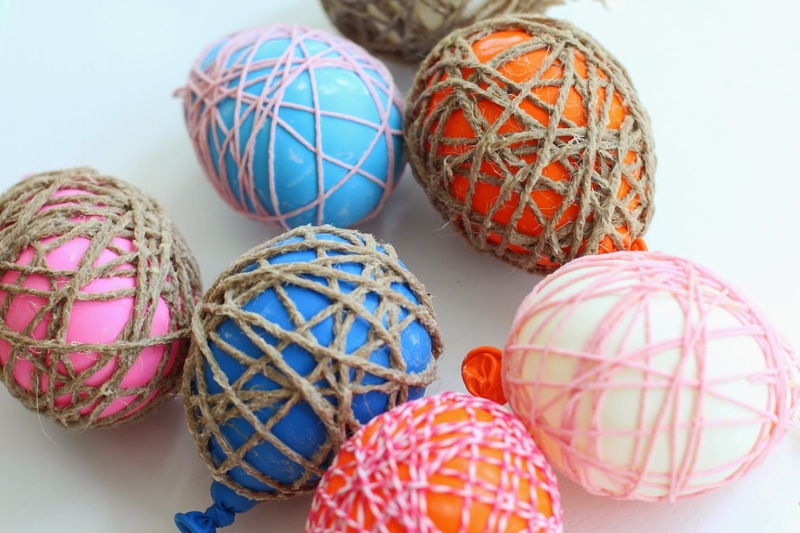 The really fun part comes in when you pop the balloons and are left with these great twine eggs! Now the house is all decorated for Easter! Happy Easter everyone! It's Easter week! That means no school, lots of messes, a little bit of a headache and mostly lots of FUN. 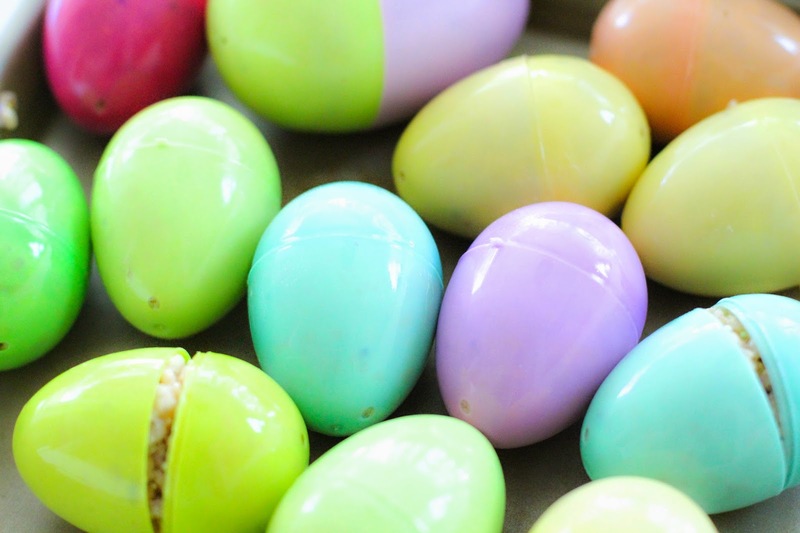 I've got a few Easter themed projects in mind for the week and the best of intentions to get them up on the blog! We kicked off the week with a super simple (and tasty) one this weekend. We call them Krispie eggs. This is quick, delicious, festive and definitely toddler friendly! All you need are those plastic eggs that the easter bunny keeps leaving you (if you're like us you've accumulated WAY too many) and the ingredients for some good old fashioned Rice Krispie treats (that's butter, marshmallows and Rice Krispies). 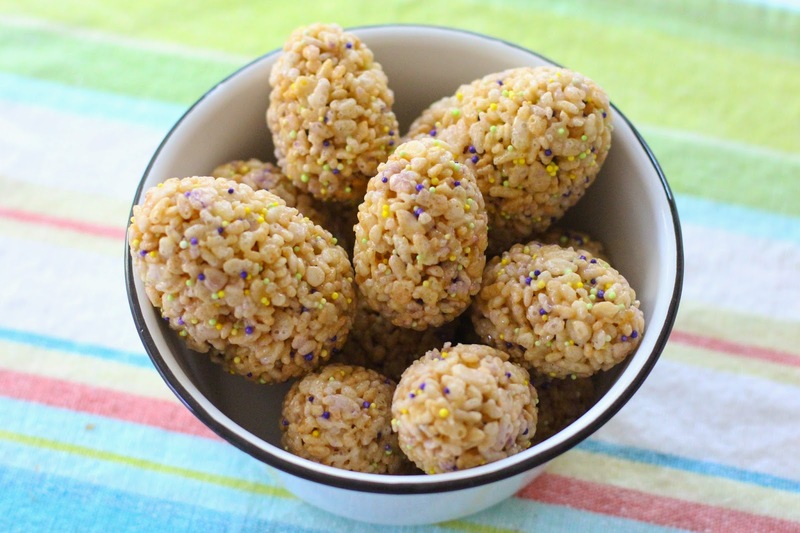 We added some spring colored non-pareils to make these look extra festive! 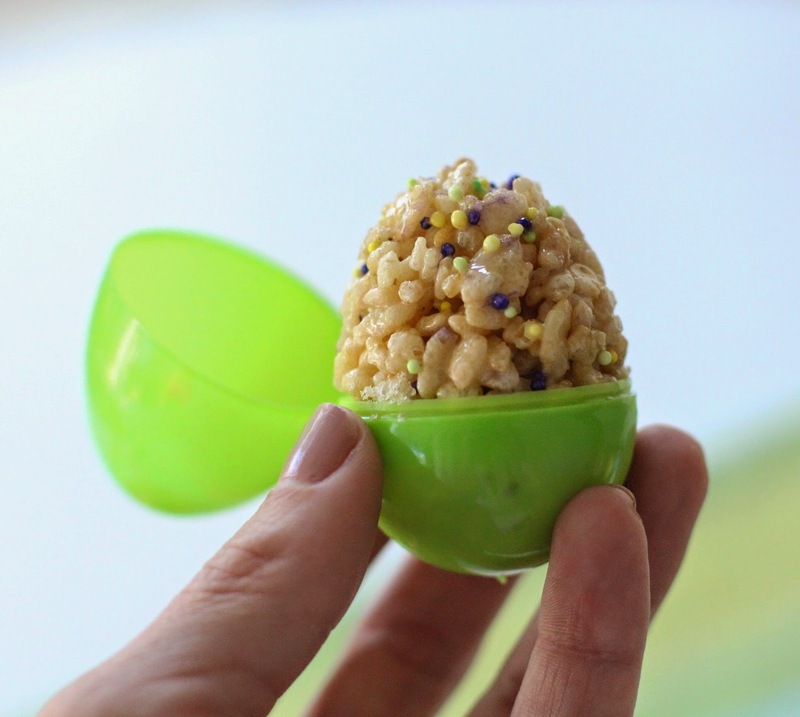 Here's how to make these cute Krispie eggs! Melt 3 Tbs butter in a saucepan over low heat. Add 40 large marshmallows and continue to stir over low heat until completely melted. Remove from heat and add 6 cups Rice Krispies (and non-pareils if you choose). Stir well, until completely combined and very sticky. Once you've got your super gooey goodness ready, just shove it into the eggs! You want them pretty full, but they need to be able to close. 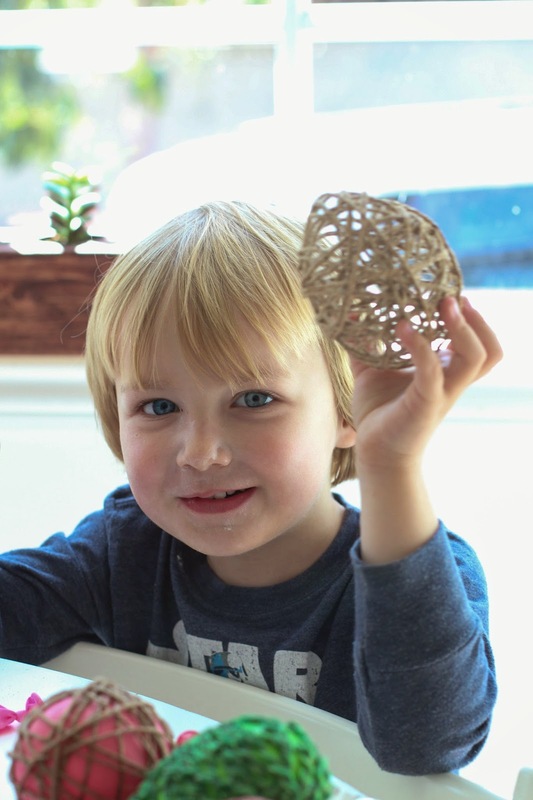 It's super simple - my 3 year old was great at it. To make things easier and prevent way to much stickiness, dip your fingers in water before touching the krispie goo. It really helps. 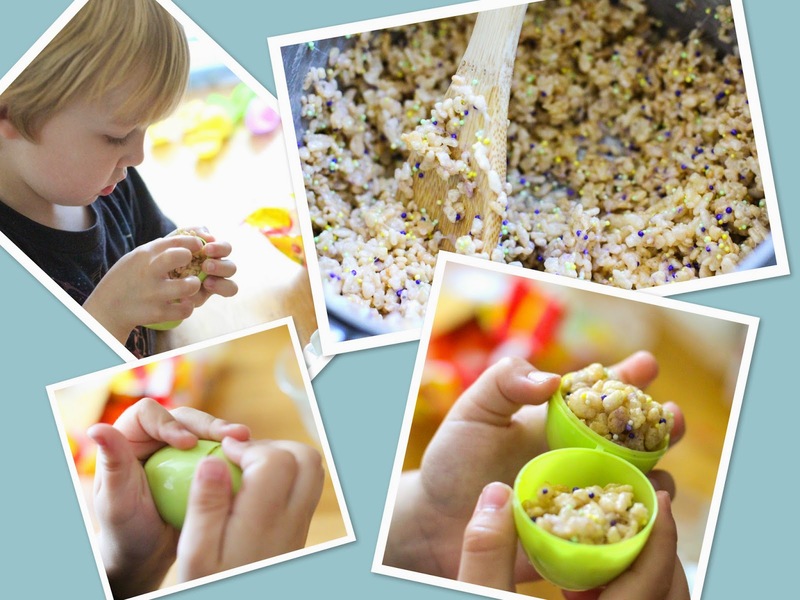 Leave the Krispie goo in the eggs until completely cool, then open up the eggs to reveal your treats! So cute, so tasty. I bet we'll make these again before Easter! I'm back on the blog (at least for today)! I've been busy enjoying life with the little one's. They are as fun as can be right now. I wish I could push the pause button for a while! We're loving Valentines season this year. It's a lovely little holiday. I've got some real sweeties in my life and it's a good reminder to tell everyone how wonderful they are. Plus, there's chocolate around every corner and you can't beat that. Carson and I have eaten our weight in Valentine's M&Ms this week. 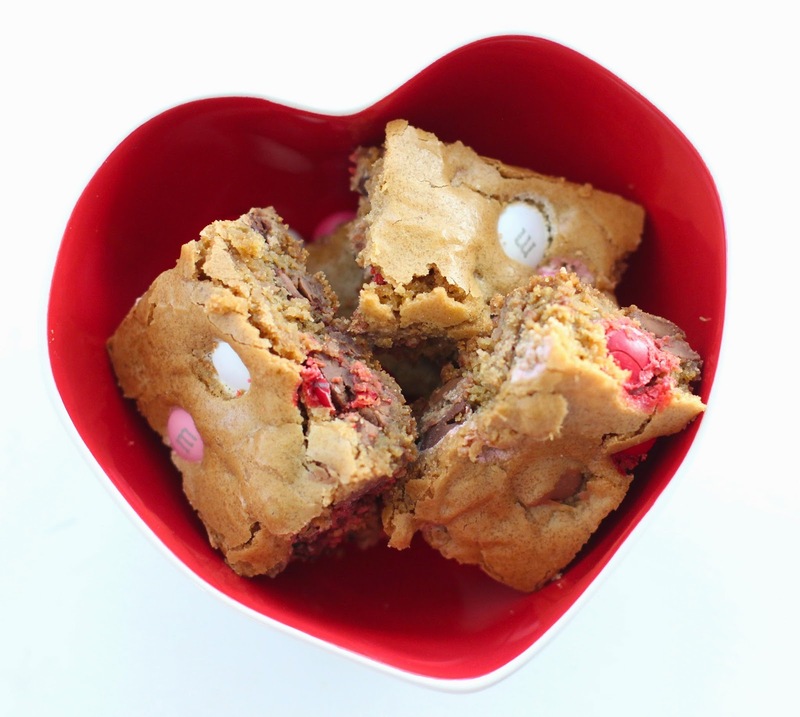 We whipped up a batch of M&M blondies for dad's office! Those lawyers could always use some sweet stuff. This is the simplest recipe ever. It's perfect with chocolate chips, nuts or whatever you like. It's obviously DELICIOUS with festive M&Ms. We love it because it's similar to chocolate chip cookies, but much simpler. It takes about 10 minutes to get these made and into the oven and they turn out great every time. Just don't overcook! Preheat oven to 350. Mix flour, baking powder, soda and salt in a mixing bowl. Cream together melted butter and brown sugar in a separate bowl. Beat together eggs and vanilla. Add to the brown sugar mixture. Slowly incorporate the dry ingredients, mixing well. Fold in your M&Ms (we also used chocolate chips), saving some to decorate the top. Smooth the batter into a 9x13" pan and sprinkle the top with the reserved M&Ms. Bake for 25-30 minutes until golden brown and set on top. Do not overcook! Share them with your loves! It's the middle of the week and the school year is already off and running for many kids (meaning I'm busier than ever with my REAL job). It's an adjustment to be back at work again now that things are busy, so we need a little mid-week pick me up. What better than a super fun and easy recipe that is just plain delicious? We made this a few weeks ago to celebrate my cute little niece and her big birthday #3. 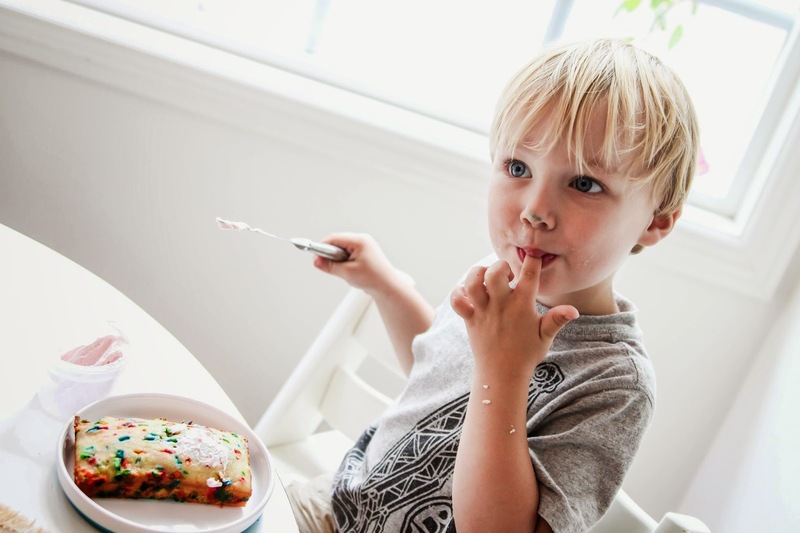 It was our first go at homemade funfetti and we'll never go back to the box. It was so tasty I knew we'd make it again soon. In a medium bowl, mix together flour, baking powder, baking soda, and salt. Whisk sugars and melted butter until it's lump free. 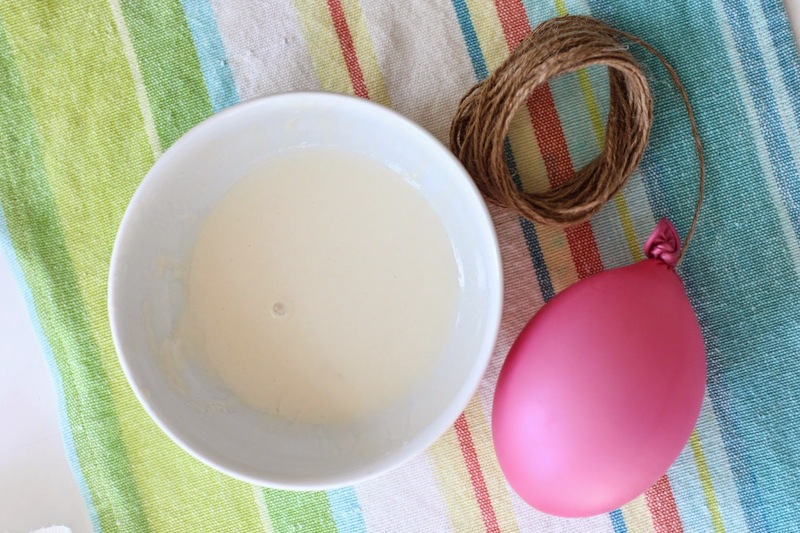 Whisk in egg, yogurt, milk, and vanilla extract until combined. Slowly mix in dry ingredients until relatively smooth. Gently stir in sprinkles, being careful not to overmix. Spoon batter into greased cupcake (or cake) pan. Bake for approx. 13 minutes. Allow to cool. To make the buttercream, beat butter with mixer until smooth and creamy (2-3 minutes). Add powdered sugar, cream, and vanilla extract with the mixer running. Increase to high speed and beat for 3 minutes. 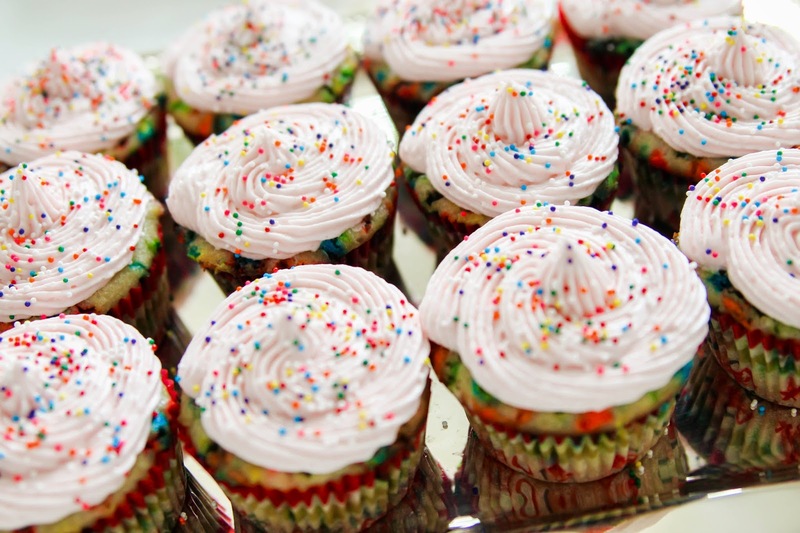 When cupcakes have cooled frost away and top with sprinkles!